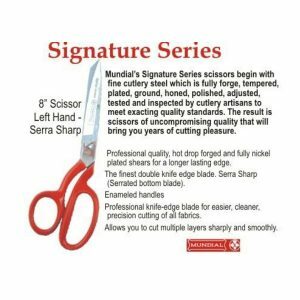 Mundial’s Left Hand Signature Series scissors begin with fine cutlery steel which is fully forged, tempered, plated, ground, hones, polished, adjusted, tested and inspected by cutlery artisans to meet exact quality standards. 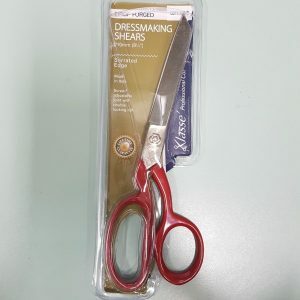 The result is scissors of uncompromising quality that will bring you years of cutting pleasure. Professional quality, hot drop forged and fully nickel plated shears for a longer lasting blade. Serra Sharp means they have a serrated bottom blade. 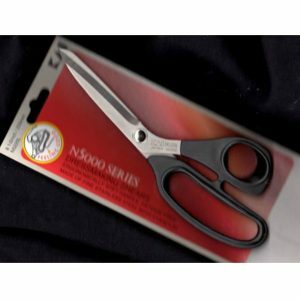 These Mundial scissors also have enameled handles and a professional knife edge blade for easier, cleaner, precision cutting of all fabrics. You will be able to cut multiple layers sharply and smoothly. These come packaged in a box and protective sleeve for the blades. Drop Forged Scissors offer durability in a stylish design. They have exceptional cutting power, especially on the tips, due to the drop forged construction. Adjustable joint with lock nut ensures the perfect adjustment does not slip. Premium quality – excellent for all fabric types from the finest silk to the heaviest denim. 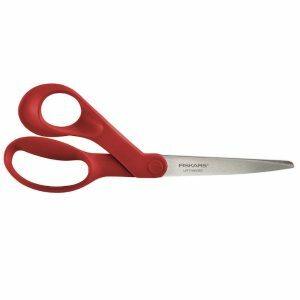 These Fiskers Scissors have an ergonomic handle for unmatched comfort and control. They have true left-handed blades for excellent visibilty when cutting. The bent handle design keeps materials flat while cutting.